anti-roll bars, and four-wheel hydraulic disc brakes. 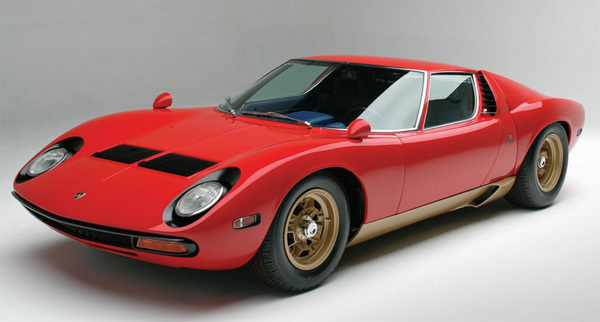 The first “supercar” from Lamborghini, and perhaps the first supercar the world had ever seen, was the P400 Miura. When it was first unveiled at the 1966 Geneva Salon, its impact was nothing short of extraordinary. Simply stated, the Miura looked like no other on the road, and it marked a paradigm shift in the design of high-performance cars. Its sensuous lines were undoubtedly indebted to the placement of its engine, which was mounted transversely, just behind the passenger compartment. The Miura’s performance also matched its looks, and the car would go on to be the poster-child for a petrol-fueled generation. As such, Miuras could often be found in the garages of many of the most fashionable celebrities of the day, including Miles Davis, Rod Stewart, and Frank Sinatra.